Cheese and wine evenings, cheese and wine to end a meal, it’s an often used combination but in reality is a less than perfect match. This becomes obvious when trying to select the right combination and the traditional claret and stilton pairing is found wanting. Dry whites, dessert wines and young reds are often better. It’s difficult to find one wine to match all of the flavours of the often a range of distinctive cheeses. In this instance one would need a wine for each cheese or enjoy a carefully selected wine with just one cheese………. for a range of cheeses try a young red wine or a lovely fruity Riesling from Australia or New Zealand that is a few years old. Claret or port and stilton is one of the best known pairings but often the richness and ‘bite’ of the cheese create a jarring flavour on the palate. 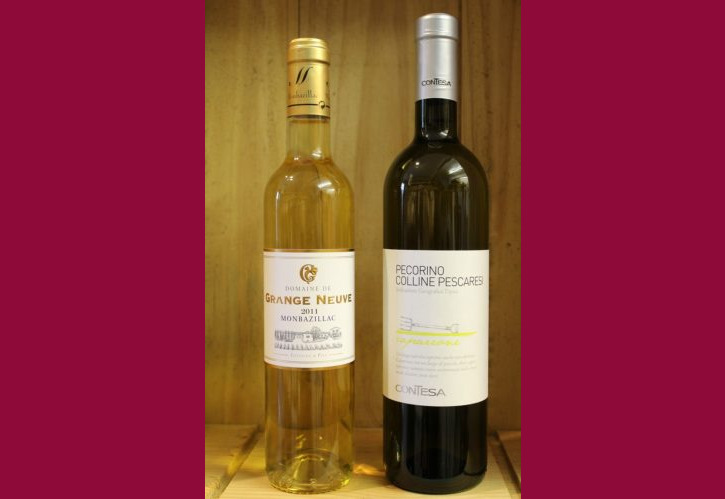 In tastings where a range of wines are available to match a range of cheeses dessert wines are often selected as the stars with stilton and other blue cheeses and also hard cheeses like cheddar and good red Leicester. These include Sauternes such as Chateau Filhot or Monbazillac such as Domaine de Grangeneuve; if you prefer port at the end of the meal try a tawny port such as the spirituous silky ones made by Grahams with an infused citrussy zesty note that complements the blue cheese flavours of stilton and Roquefort etc. The many styles of goats cheese from the very light young cheese flavours to the mature slightly nutty notes require different wines to be the best accompaniments. Sauvignon Blanc based wines from France such as Touraine Sauvignon or from New Zealand such as Makutu one are a lovely match to the acidity of the young goats cheese. A more mature version of goats cheese would be best matched with dry Viognier based wine such as that from Viu Manent in Chile or Mont Rocher in the South of France. Some of the cheeses that are tricky to match with wine include the soft white rinded ones including Brie and Camembert though a vibrant yet soft and youthful fruity Chilean Merlot, a light fruity Beaujolais or a ripe fruity non classic Pinot Noir from the South of France such as Les Volets would be an ideal match. Pecorino from Italy was a surprise success with these cheeses. Champagne is also great with Camembert. Robust red wines have quite obvious tannins that would drown out the more subtle flavours and texture of these cheeses. Also a lightly oaked Chardonnay is lovely with Chaume for example. Gewurztraminer is an obvious choice with intense pungent cheese such as Munster and Pont l’Eveque otherwise it is difficult to find the right match. If you decide to serve a red wine with the cheese course try a mature wine such as a Crianza or Reserva Rioja as the oakaging will have softened the flavours of the tannins, and is great when served with a strong cheese such as Cheddar. Tannic red wines are terrific with rich, aged cheeses, because their tannins literally bind to protein and fat, cleaning your palate after each bite. But the same process makes tannic wines feel far too astringent with young cheeses. There are many more cheese and wine matches to be made but it is worth experimenting as one wine definitely does not fit all!